They harness the power of ultrasonic sound frequencies provided by transducers to convert electricity into intense sound waves that cause the formation and implosion of minuscule bubbles in a liquid cleaning medium. The bubbles perform a scrubbing action that reaches into grooves and hidden parts of products that are immersed into an agitated fluid. The frequencies of the sound waves are used in the ultrasonic cleaning equipment to adjust the size and amount of cavitation or the formation and collapse of the bubbles. Ultrasonic cleaning equipment has multiple benefits, including accuracy, consistency, and speed. Ultrasonic cleaning equipment is also more environmentally-friendly than using chemical solvents or hazardous chemicals. Unfortunately, tightly bonded soils, greases, and contaminants cannot always be removed with the use of ultrasonic cleaning equipment alone, but combining aqueous cleaning techniques with ultrasonic cleaning technology has been found to be an effective and environmentally-safe method of cleaning. 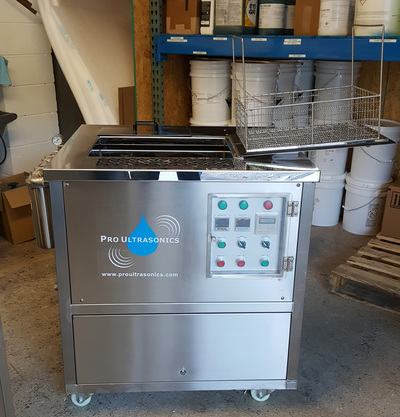 Ultrasonic cleaning equipment is capable of cleaning individual parts as well as multiple items simultaneously and is used in a variety of both commercial and industrial applications. Ultrasonic jewelry cleaning, window blind cleaning, and golf club cleaning are all completed with commercial ultrasonic cleaning equipment. Industrial applications include automotive parts, critical and precision cleaning, and pre- and post-production cleaning. All ultrasonic cleaning equipment consists of a transducer, a generator, and an immersion tank at the least. The tank ranges in sizes from small and portable to industrial tanks. They may be long and narrow or rectangular depending on the application. The parts that require cleaning are placed into the tank which contains an ultrasound conductive fluid. There are three commonly used cleaning mediums: hot water cleaning, which uses a heated water stream, aqueous cleaning, which uses a water-based ultrasonic cleaning solution, and solvent or vapor cleaning, in which the solvent is evaporated then condensed onto the surface of the parts. The process begins when there is cavitation. Cavitation is caused by the transducer which, depending on the equipment used, is either mounted directly in the tank or placed inside during operation. When the transducer introduces ultrasonic sound waves into the tank, countless minute imploding bubbles release both energy and heat to provide a highly efficient method of scrubbing exposed and concealed surfaces of the immersed parts. The frequency of the ultrasonic sound waves is directly correlated to the number of implosions created, which provides operators with a great amount of control. For example, high frequencies create a larger number of implosions which is particularly good at removing very small particles and has no harmful or damaging effect on the surface of the parts or equipment being cleaned. Ultrasonic Cleaning Equipment Ultrasonic cleaning equipment consists of a number of specialized cleaning machines that are used to clean a variety of parts and products.